Vintage posters are life and death. From the pits of hell to the sanctity of heaven, Art Nouveau posters sure do cover the spectrum of suffering and delight. Our Creative Director, Jim McCobb, combined some of his favorites in a tale-of-two-worlds collage: knife-wielding pimps and evil bunnies contrast with the serenity of forest nymphs and pastel skies. Despite the dichotomy, the aesthetics of Art Nouveau course through the image fluidly: impressionistic strokes of color, three-dimensional shadows and contours, and elegant decoration are all trademarks of the genre. Scroll down to see Jim’s interpretation, as well as all the original posters that inspired him. 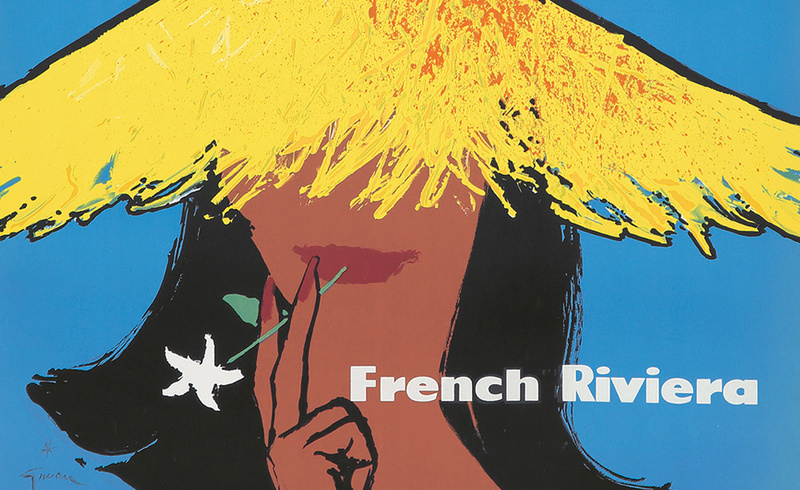 “Berthon… produced about 60 [decorative panels]… in contrast to his handful of posters…. 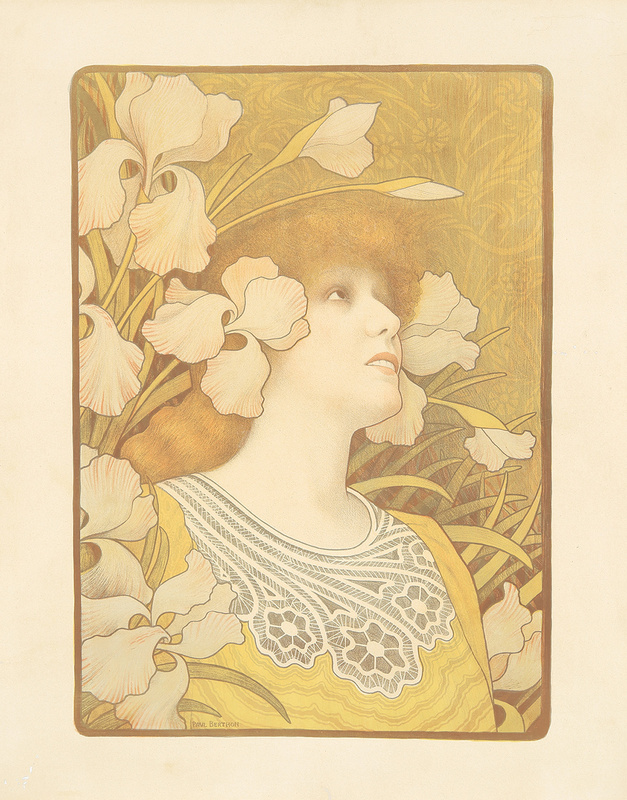 This is his most famous lithograph, a portrait of Sarah Bernhardt in the title role of ‘La Princesse Lointaine’ (‘The Faraway Princess’) which she first played in 1894. In this design Berthon transformed her costume tiara with its flowery jeweled garland into real irises framing her idealized face” (Gold, p. 120). “…Pal, like Lautrec and other poster artists influenced by their classical academic training, used classical symbols, such as goddesses, in their advertising. 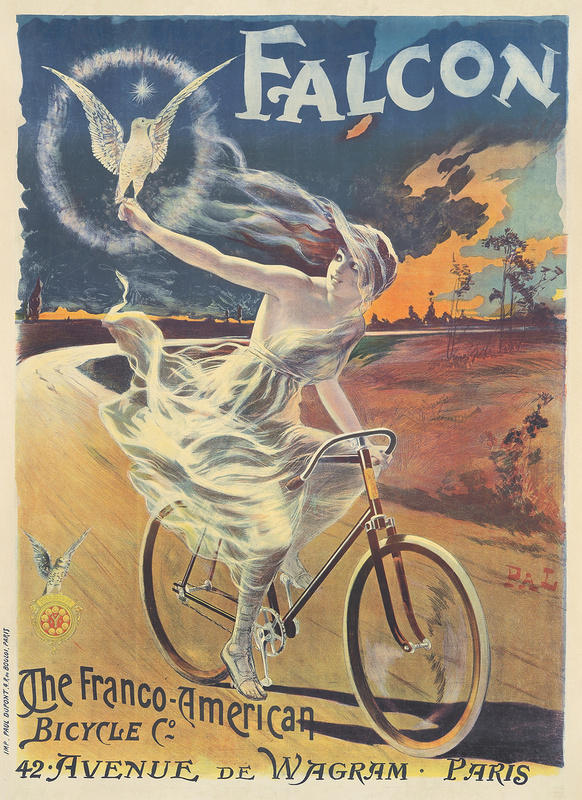 Women dominate his posters, and they tend to be much sexier than Chéret’s girls” (Bicycle Posters, p. 6). Along with Bixton, Falcon was one of two brands which formed the Franco-American Bicycle Company. This is one of Pal’s finest cycling designs: the sky a tempestuous mix of burgundy, peach, and navy, while the mythical rider brandishes a pure, beaming falcon, illuminating the otherwise ominous road ahead. Interestingly, Pal often omitted the spokes of the wheel—while difficult to replicate, the exclusion also alludes to the bicycle’s capacity for speed. 326. The Century / Midsummer Holiday Number. 1897. Parrish illustrated many magazines—Scribner’s, Collier’s, Success, Lippincott’s—and every now and then, he executed posters for them, conceived more or less as covers, and of approximately the same size. 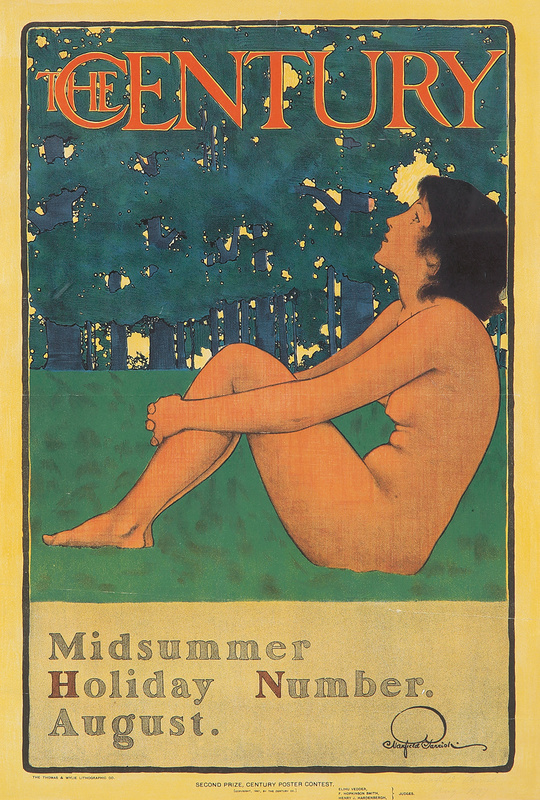 This design of a woman nakedly lost in thought earned him second prize in The Century poster contest of 1897, as noted at the bottom of the poster. 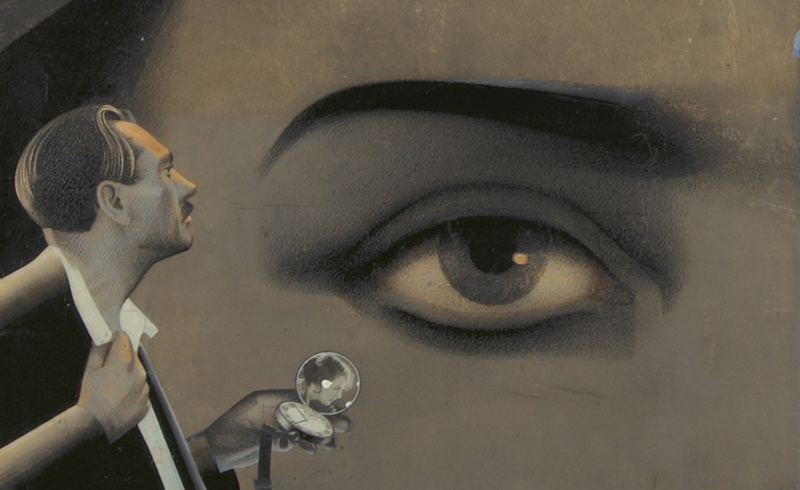 In May 1896, French art critic and artist, Alexandre de Beaumont, organized the first exhibition of Belgian poster art, in Toulouse, France, sponsored by a local art and literature magazine, L’Effort. Not only would Beaumont be the event’s organizational force, he would create the stunning promotional posters as well. 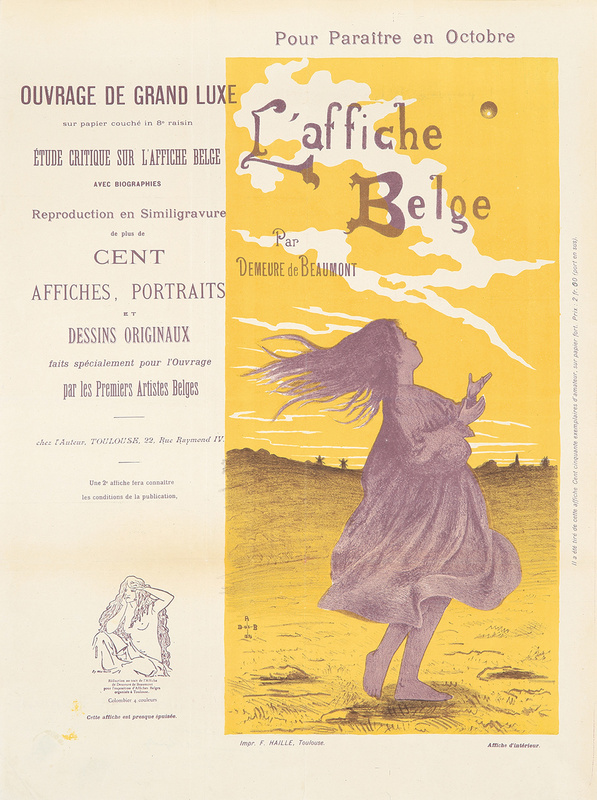 This advertisement also anticipates his forthcoming two-volume book that celebrated Belgian lithography, titled “L’Affiche Belge,” which he published on his own. 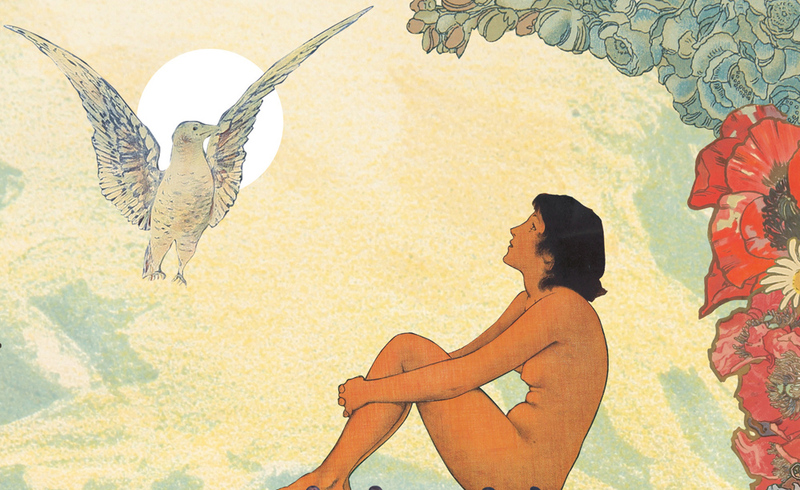 Volume one was comprised of critical essays and thirty-three artist biographies, while the 56-page second volume was dedicated exclusively to illustrations, specifically the Belgian Art Nouveau movement. De Beaumont classified the output of these artists into five regions: Brussels, Antwerp, Gent, Mons and Liège. Without question, this ambitious dual extolment of exhibition and publication was responsible for placing the Belgian poster in a well-deserved spotlight. In what is practically the mirror image of Le Petit Parisien’s poster for the Paris-Madrid race (see PAI-LXXIII, 70), we are here offered the skyline of the small town of Le Puy. 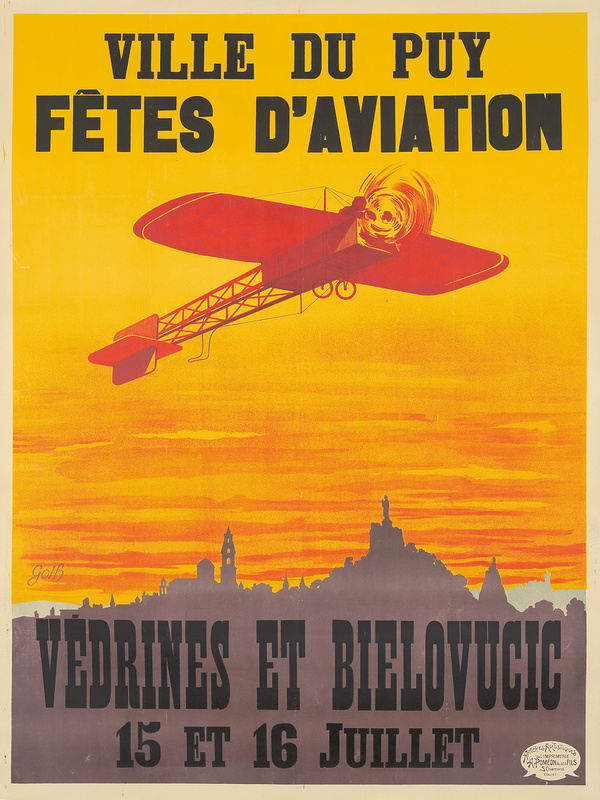 The text below advertises a rivalry between Jules Vedrines (who would become the first pilot to break 100 mph the following year) and the Peruvian Juan Bielovucic Cavalié (the second aviator to make it across the Alps). Rare! 321. 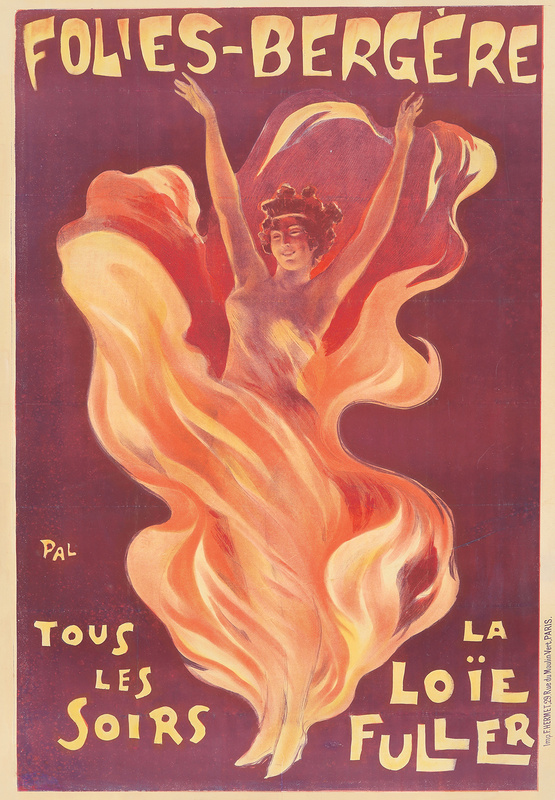 Folies-Bergère / La Loïe Fuller. 1897. 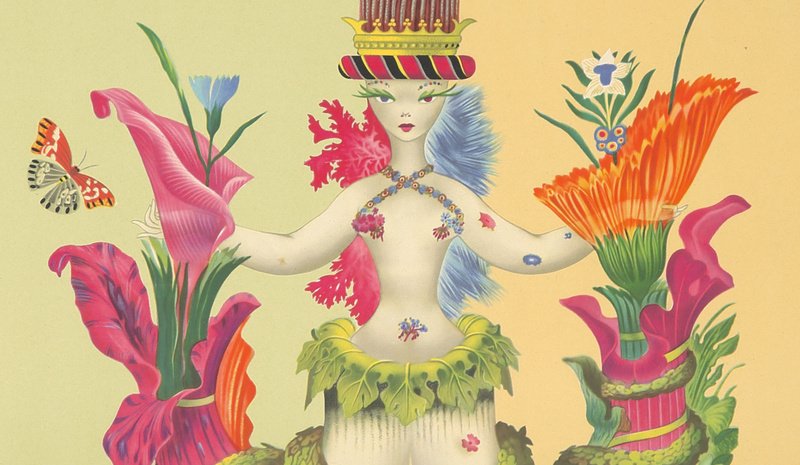 Pal created a total of five posters for Fuller’s appearances at the Folies-Bergère. Here, the billowing folds of her diaphonous dress are rendered in flaming orange, adding considerably to the light-and-motion image with which we are presented. 21. The Fak Hongs / Numero d'Illusion. ca. 1901. 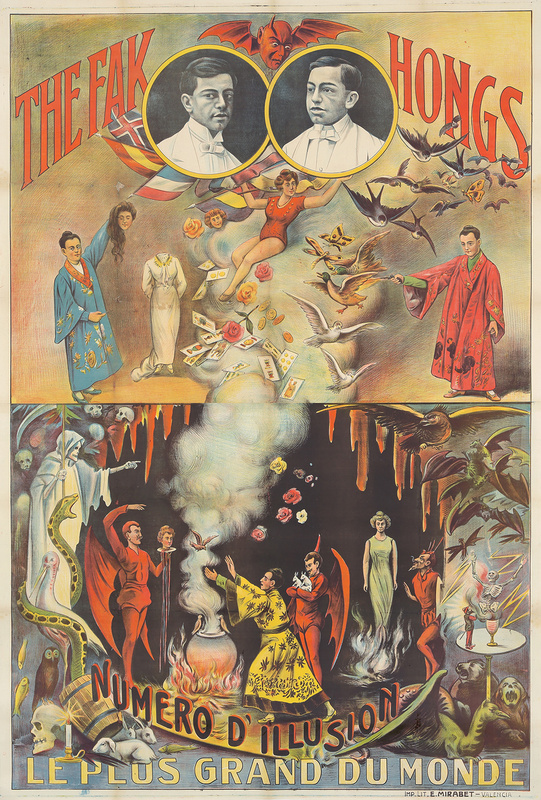 In one of the earliest posters for this team of Asian illusionists, two sheets are employed to ample effect, with each half illustrating several of the performed tricks by the Fak Hongs. The disparate scenes are united by the smoldering fumes emanating from the cauldron at the bottom. And what an array of mystical—and frequently disembodied—deceptions the audience must have been in for. The anonymous artist also opted to leave no magic cliché behind: the Grim Reaper, dragons, devils, skulls, serpents, and exotic birds offer a taste of the fabulous and frightful possibilities in this black arts affair. 219. Le Journal / Fleur des Rues. 1904. This horrifying image is a huge mystery. 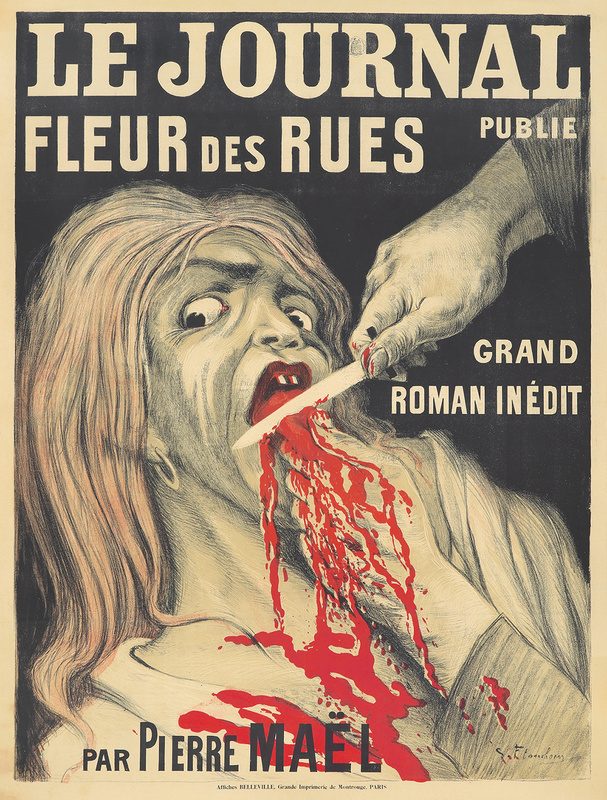 It’s obviously advertising one of the salacious novels typically serialized in Le Journal, a Parisian daily published between 1892 and 1944; “Fleur des Rues” or “Flower of the Streets” is a clear nickname for a prostitute. “Pierre Maël,” the putative author, is actually the nom de plume of two French authors, Charles Causse (1862-1904) and Charles Vincent (1851-1920). However, “Fleur des Rues” does not appear as one of the titles in the “exhaustive list” of Pierre Maël’s oeuvre. Given the bloodcurdling advertising, it’s possible the book may have been censored, making this poster exceptionally rare. 350. Exposition Décennale de l’Automobile. 1907. This two-sheet automotive show poster is of impressive size and design, and fraught with dramatic hues and romantic tantalization, which are captivating without the presence of a single motorized vehicle. The Grand Palais in the background is surrounded by hundreds of horseless carriages, and an invitation is extended by the lovely seductive model personifying the splendor of the exhibition. The great, ghostly Leslie Carter is here adorned with some of the most exquisitely detailed jewelry ever designed by Mucha for lithographic immortality. But who was this otherwise unknown goddess? Mrs. Leslie Carter was a “captivating woman who desired to become a great actress… She gained a fortune after a marriage to—and later divorce from—a billionaire, Leslie Carter, whose name she retained” (Lendl/Prague, p. 266). She conceived a vanity project, a play named “Kassa,” about “a Hungarian virgin ready to enter a convent, [but then] was seduced by Prince Béla, who a year later left her with a child. Kassa became insane and entered a convent, thinking that only a single day had passed” (Mucha/Art Nouveau, p. 174). 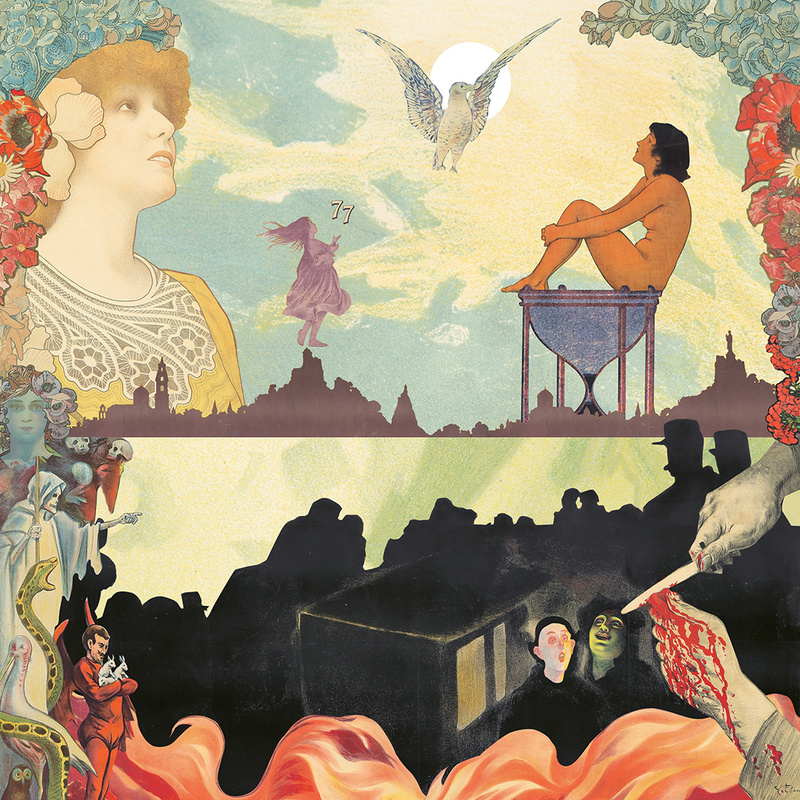 Mucha contributed over 250 designs for the project, including stage, costume, and scenery design, but the play was a failure and Carter went bankrupt. Neither Mucha nor Long, the author, received an honorarium.